Fresholi Bites: Christmas Gift Ideas & Extra Special Offers!! Christmas is such a lovely time of year but for most of us, it can be a stressful one too, not knowing what to buy for someone special. Nothing quite compares to something that has been lovingly handcrafted and a number of members from the Fresholi Community have come up trumps, each offering very individual and unique gift ideas at exceptionally good value for money. 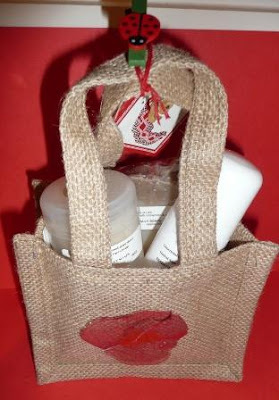 From Essentially Soaps, a gift bag for the Man who has everything. - 'Spice of life' hand made hand cut soap fragranced with Essentially Soap's 'Spice of Life' blendof essential oils. PLUS!! During the Christmas period, all Essentially Soaps' soaps are only £2.00, perfect for extra stocking fillers or just a treat for yourself!! 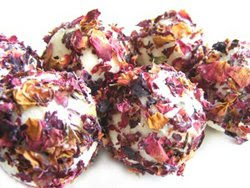 Wildly decadent nourishing rose petal bath truffles to pamper, soothe the skin and elevate the mind. Each truffle is enriched with all natural creamy cocoa butter and shea butter, pure essential oils and hand rolled in luxurious rose petals. Feel like a queen surrounded in a warm bath of rose petals. Don't want petals floating in the bath? No worries, an organza bag is included! Six beautiful truffles nestled in tissue paper and presented in a gorgeous gold gift box with ribbon. - Blue Lagoon bath bomb – it’s truly luxurious since it’s enriched with Monoi de Tahiti and the same essential oil blend as the soap. - A brand new coconut and frangipani salt glow body scrub. This is a fine grain salt scrub with Monoi de Tahiti, odour retained coconut oil, nilotica shea butter, honey, D-Panthenol and Vitamin E. The odour is boosted with frangipani absolute .... so it’s a heavenly aroma that leaves the skin feeling silky. 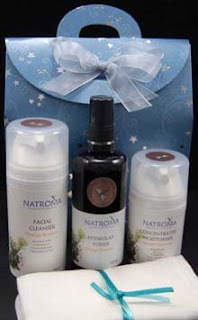 - The final item in the hamper is special since it’s a preview of one of the 2009 Natroma balm products. It contains Nilotica shea and mango butters with ricebran and jojoba oils, odour retained coconut oil, squalane, and is further enriched with sea buckthorn and calendula botanical extracts. It’s completely natural, protected with both vitamin E and rosemary anti-oxidant. Containing a blend of sweet essentail oils (palmarosa, ylang ylang, sweet orange) with a dash of cinnamon for a warm Christmassy fragrance. 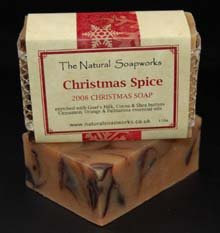 It’s naturally coloured with paprika and a deep cinnamon swirl.NSW also have 2 other Christmas soaps this year – the ever popular Frankincense and Myrrh, and another new one called Gluwein (cloves, orange and cinnamon). 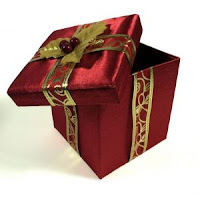 All orders will receive a free gift: Christmas Mini. 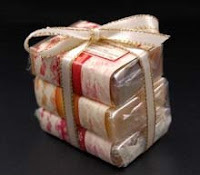 This is 3 of NSW Christmas mini soaps (25g each) wrapped with a gold and cream ribbon. The retail value is £2.85. 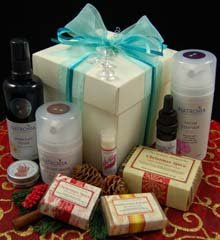 But if you spend over £30, instead of the mini soaps you’ll be upgraded to the Blue Ballotin gift set (see piccie). This is a lovely little gift box which contains: a pretty cup cake goat’s milk soap (decorated with petals/rose buds etc), a mini soap bar, a round snowflake bath bomb, and some bath melts (these contain cocoa/shea butters, odour retained coconut oil, sweet almond oil and a blend of essential oils). There are various fragrances in each box, and it has a retail value of £5.50. The Natural Soapworks: quote NATFRESH in the Paypal notes box at the checkout to receive your gift. Receive 10% discount at Natroma by quoting NATFRESH at the checkout for a 10% discount! 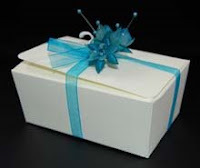 Natroma are using high quality blue coloured cardboard gift boxes which are decorated with foiled silver stars, finished off with an organza bow. Pictured here (left) is the facial starter kit, and includes the cleanser, toner and moisturizer with a muslin cloth for £24.50. The Natroma range includes mainly organic ingredients, luxurious butters and oils and the cream products are enriched with D-Panthenol, squalane and numerous botanical extracts. Natroma products have a light skin-feel, but are very concentrated.